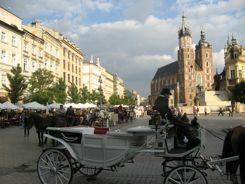 Krakow is one of the oldest cities in Poland, and as in all old cities, Krakow legends abound. ...or the Dragon of Wawel Hill. The dragon was supposedly slain by a boy who became King Krak, the city's legendary founder. A cobbler's apprentice named Krak. Arak took on the challenge. He stuffed a lamb with sulphur and hot spices and left it out for the dragon. You've got to get a giggle out of that.... exploding dragons! This metal sculpture of a dragon is outside of a cave called the Dragon's Den at the foot of Wawel Hill. This dragon actually breaths fire when someone texts him on their mobile phone as you can see... much to the delight of tourists. The cave was a tavern in medieval times, but now it's just a cave. You can tour it if you want, but you'll have to use your imagination for dragons on the inside. On the top of Wawel Hill is where you'll find the Castle and Cathedral of the same name. The hill towers over a bend in the Vistula River on one side (convenient for the dragon to drink from), and the city on the other. The Wawel Cathedral also features a statue of the dragon, and you'll see little green dragons at all of the souvenir stands. We bought one to hang on our Christmas tree... a great travel memory! You'll spend a lot of time in the main market square. It was the biggest square in medieval Europe, and it seems to be where everyone hangs out today. The square is filled with flower stalls and outdoor cafes. It's surrounded by beautiful buildings that house antique stores, boutiques and restaurants. There are two towers on St. Mary's Church. The lower one is actually the church tower.... the taller one is the city watchtower. From this higher tower, you'll hear a bugle played on the hour. The story goes that during a Tartar invasion, a watchman in the tower saw the enemy approaching and sounded the alarm. Before he could finish the tune, an arrow pierced his throat. It was decreed that a bugle call, the "hejnal", should be played each day in memory of the old watchman hero. The hejnal of Krakow is a Krakow legend that has continued almost without interruption for seven hundred years. ...and one about enchanted knights turned to pigeons. 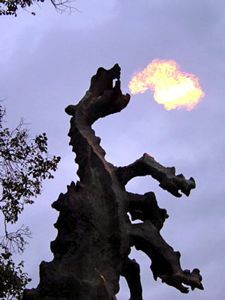 Those are too long for the telling here, but when you're in Krakow, wander by and see the fire breathing Smok statue, maybe play tourist and explore the Dragon's Den cave under Wawel Hill. Stop in one of Krakow's sidewalk cafes, listen for the hejnal, and enjoy those Krakow legends.